Today, I’m bringing you not one, but two very cool and free social discovery tools to your attention. While I am a bit late to the game in publishing my take on the first one I am going to review (Bill Boorman, Marc Drees and a few others beat me to the punch – I need to clone myself! ), my first exposure to Falcon’s social discovery tool actually came from Chris Cruz on 1/7/13 when he responded to my post on how to use Rapportive and Gmail to divine and confirm almost any email address. First, I’ll review Falcon’s solution, including a 2 minute video hands-on demo and then I’ll cover TalentBin’s social discovery tool. Gwendall Esnault has whipped up something very interesting in Falcon, which was actually developed after he created Hackerface. Falcon allows you to find people’s “social details” by hovering their names on certain sites. In other words – you can use one social profile to discover many of the other social profiles that the person might also have. 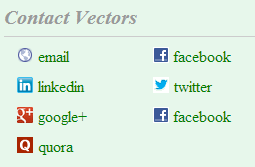 For example, from someone’s Twitter handle, you could quickly reveal their Facebook and Github profiles. While the Falcon.io site mentions that the Chrome plugin/extension leverages Hacker News, Tweetdeck, Twitter, Github and Dribble, there isn’t much documentation to be found on exactly what other sites Falcon leverages. It very likely works with other sites I have yet to discover. However, there is one key site that it doesn’t seem to work with – LinkedIn. In addition to working by hovering your mouse over certain social links, you can also enter and search for specific social profiles. I’ve entered and successfully searched for Facebook, Google+ and Quora profiles. If you like what Falcon can do for you, then you might also like TalentBin’s free social discovery tool. If you’re not familiar with TalentBin, their “talent search engine for the entire web” is what I would consider to be one of a few sourcing solutions available on the market today that harnesses the power of big data when it comes to sourcing and recruiting. In addition to their premium solution, the wonderful folks at TalentBin whipped up a free Chrome extension/plugin that allows you to perform social discovery from any one of a number of sites. As you can see from the image to the right – TalentBin cross references a HUGE number of sites. It also leverages an incredibly simple and easy 1 click functionality to serve up results – no mousing over links or entering URLs to search for results. The only catch (and it’s a BIG catch) is that you have to be a premium user to take action on the data, including the “contact vectors” that TalentBin conveniently serves up to you (which is a fantastic feature, btw). I know some people may be less excited about a freemium tool, but I think TalentBin’s expansive social search and simple execution is impressive. I also think it provides insight into what’s to come with regard to social aggregation empowering research, sourcing and recruiting. Plus, sometimes you do get what you pay for. Download the extension file from the website and save it to your computer. Locate the extension file on your computer and drag the file onto the Extensions page. TalentBin’s Chrome extension cross references a surprisingly large number of social sites that it can leverage cross for social discovery. This impressive functionality is no doubt a direct result of the work they’ve been performing on their premium solution. As such, while TalentBin’s browser extension is free, you can’t make much use of it without being a user of their premium product. On the flip side, while the Falcon social discovery tool isn’t as comprehensive as TalentBin’s, it’s 100% free to use and take action on – thanks Gwendall! If Gwendall’s open to suggestions, I would recommend adding support for LinkedIn profiles, as well as functionality similar to TalentBin’ simple one-click execution over having to hover over links or search for URL’s. However, I’m certainly not complaining about Falcon’s functionality – I’ll gladly use Falcon as is!